Hello Linux Geeksters. 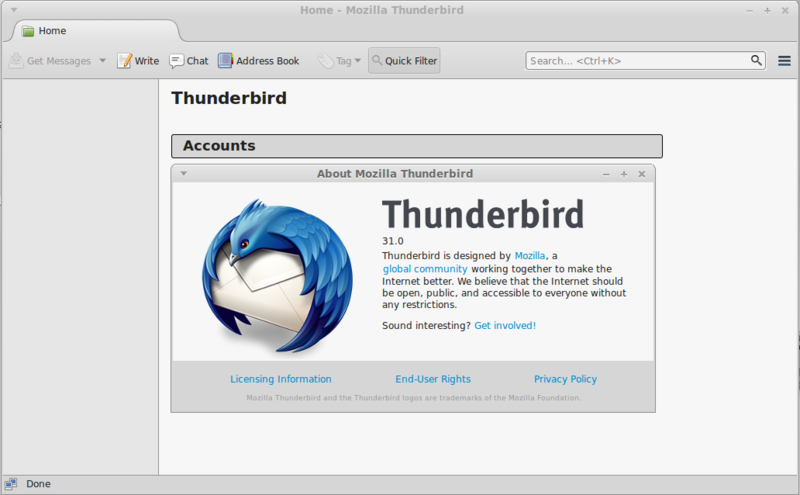 As you may know, Thunderbird is an open-source e-mail client and chat client developed by Mozilla. Among others, it has support for email addresses, newsgroup, news feed and chat (XMPP, IRC, Twitter) Client, managing multiple accounts. Also, it has support for different themes and its power can be extended by plugins. Mozilla has neglected Thunderbird, in order to work at the browser and so, the email client receives mostly bug-fixes. Also worth mentioning, it has adopted the Australis interface, like the latest Firefox versions did. The latest version available is Thunderbird 31.0, which has been released a while ago, coming with changes. Among others, some CSS variables have been fixed, the dark theme has been improved, so that the users can see the text beside the icons of the quickfilter, an “Open containing folder” feature has been added to the messages in search results, when a message, feed or newsgroup message is opened in a new tab, the tab is no longer transparent, the Address Book quick search now works properly, the slow responding feed favicons are now handled properly, double-clicking in a blank space no longer opens the Advanced Property Editor and the Ubuntu One Support has been removed. For more information about this release, see the changelog. In this article I will show you how to install Thunderbird 31.0 on Ubuntu, Linux Mint, Elementary OS, Pinguy OS, LXLE, Deepin, Linux Lite, Peppermint, Debian, Kwheezy, Crunchbang, SparkyLinux, Fedora, CentOS, OpenSUSE, Mageia and OpenMandriva. Because Thunderbird 31 is not available via any repository yet, we have to download Thunderbird 31 from the official ite site, extract the archive, move to /opt and alias the launcher. To start Thunderbird 31, just open a terminal, type thunderbird and hit enter. Note: This will replace the version of Thunderbird you have already on your system with Thunderbird 31.